Hope you all had a nice labor day! We sure enjoyed the time to relax, but now we're back for some special fall posts and even more real weddings and engagements. So, for today, here's a great color combo for fall or winter. Slate gray is the new chocolate brown and, while we love chocolate brown, we love the updated, modern look of the cool gray even more. 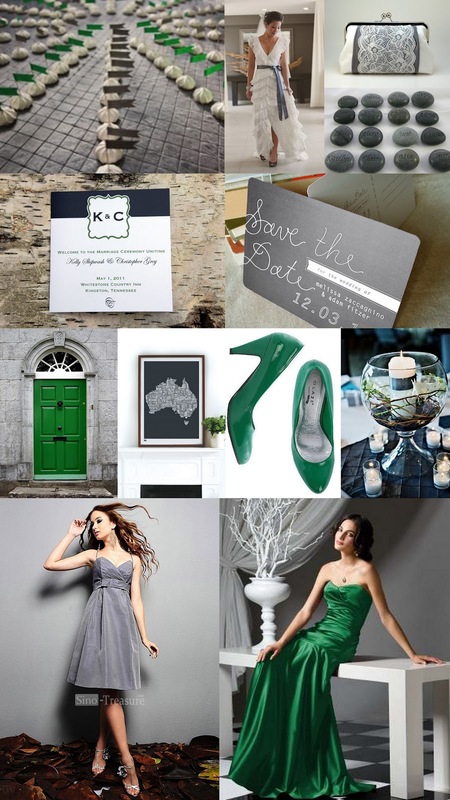 Here we have it paired with vibrant kelly green for a sophisticated feel. Be sure to tune in next week when we pair this slate gray shade with orange and yellow for a look that's just a bit more playful! wow, this is gorgeous! love this color combination - a fresh look for fall, too! so thrilled to see my programs here! thank you!